The Celtics roller coaster of a season continues as they head into the playoffs with Home-Court Advantage. Their first round matchup is against the Indiana Pacers, who have been one of the surprises of the season, maintaining their success after All-Star Victor Oladipo went down with a season ending knee injury. No one really knows how the Celtics are gonna fare in the playoffs, as they had been a tale of two teams all season long. There have been the games where they have been a well oiled machine, with all five players touching the ball on offense and playing staunch defense, causing turnovers and running in transition. There are also days where they play with no identity, letting up open shot after open shot on defense, and players alternating hero ball on offense. The Celtics have the talent and potential to represent the Eastern Conference in the finals, but they could also get eliminated by Indiana if they don’t play their style of basketball. There are factors that will lead them to easily prevail in their first round series, but there is also a chance for them to be eliminated early by the hands of the Pacers. When every player on the Celtics plays to their abilities, they are an offensive juggernaut who will attack you from all three levels. The Pacers don’t have a guy who can create their own offense whenever they want, while the Celtics have several. Kyrie Irving may be the best isolation player in the NBA not named James Harden, Tatum can be crafty from the mid range as well. Morris is an assassin from three, whether spot up or off the dribble, Hayward when playing well can slash with the best of them as well. With shot creators like the ones mentioned, a seasoned veteran in Horford to anchor both the offense and defense, streaky scorers in Brown and Rozier, who play at all star levels when their shots are falling, make the Celtics one of the toughest outs in the playoffs. The Shamrocks could sweep the Pacers, yes they’re that talented. The Pacers best player currently active, Myles Turner, would probably be the third of fourth best player on the Celtics. Boston needs to capitalize on the discrepancy in talent, because it’s the only series where the difference will be this big. People show way too much hate toward Gordon Hayward who struggled at times this season. The 29 year old is only one year removed from a gruesome ankle injury and has been trying to reacquaint himself all season. The problem with Hayward for a while was not the physical part, but the mental aspect of returning. Every time he attacks, every time he hits the floor, even every time he jumps, he is reminded of one of the most brutal injuries in NBA history. You can start to see how the mental psyche of the injury is starting to go away. He has scored double digits in each of his last 8 games and 11 out f the last 12. You can also see it in the way he’s been playing, being more aggressive towards the basketball and starting to play a little more selfishly. If he can continue this output into the playoffs, it adds just another weapon to an already loaded cache that is the Shamrocks. If Hayward keeps it up, they not only become a favorite in the series, but a favorite in the entire Eastern conference. Though the Pacers took LeBron James and the Washington Generals(otherwise known as the Cavaliers) to 7 games and gave them a real run for their money, they still have very limited playoff experience. Only 5 players on the Pacers have played in 10 or more playoff games, to put that into perspective Kyrie Irving, Al Horford, Aron Baynes, and Marcus Smart have played in more playoff games than the ENTIRE Pacers roster. Experience is crucial when you get to the playoffs, as you are on a much bigger stage than the regular season. Both the veterans and the young guys on the Celtics have had experience with major minutes in the playoffs, as 10 different Celtics players have started in a playoff game. Boston is more prepared for the bright lights, compared to a Pacers squad that’s lacking major playoff experience. Look in the first couple of games to see members of the Pacers acting a little scared and making sloppy mistakes as they get used to a playoff atmosphere. While the Pacers may not have any star players ever since Victor Oladipo injured his knee, they do play together and have a very balanced attack. 7 players on the Pacers averaged double figures, and 12 players have a true shooting percentage of over 50%. They also have a criminally underrated coach in Nate McMillan who has them moving the ball so well. Another thing about the Pacers is that they play hard each and every possession. People think that playing hard is a given in the NBA but if you consistently watch you can see how that’s not true. Exhibit A of that claim is the Boston Celtics, as sometimes they go out there and act like they don’t even want to be there. Games like that need to be completely erased for the Celtics, as they need to play every second like it’s their last of the season. Some teams are good enough to take plays off and everything will work out ok (See: Warriors), but the Celtics are not talented enough to play three bad quarters and just “turn it on” and expect to win the game. The Green need to play 48 hard minutes. Or else they’re going to be watching the rest of the playoffs on a TV. Marcus Smart tearing his oblique in a throwaway game at the end of the regular season left this writer sick to his stomach, Smart is not a player you want to lose for the playoffs. While his per game stats may seem average at best (9 points 3 rebounds and 4 assists) Smart is essential for this team to succeed. The heart and soul of the Celtics, he gets on the floor for every loose ball, can guard 4 positions, and is one of the toughest players in the entire NBA. His jump shot was also starting to improve as well, as I no longer yell “please no” every time he releases it. While the depth of the Celtics cushions the blow, nothing makes up for his defense and his toughness. Every contender needs a pest, and the Celtics just lost theirs. When the Thunder traded for Carmelo Anthony last season, everyone thought they could challenge, but they fell on their face and lost in the first round. If you watched them play it’s easy to see why. Russell Westbrook, Paul George, and Carmelo Anthony would take turns playing isolation basketball, with the other four players standing around. You see the same thing with the Boston Celtics for certain stretches. Whether it be Irving, Tatum, Morris, and even Brown, it looks like they’re playing 2k, trying to score on the entire defense. When the “who’s handles are better” offense, the movement stalls and everyone just stands there and watch. You need all five guys moving for an offense to be successful, and the Celtics dont have that. If that type of play continues in the playoffs the Celtics are doomed. Remember the year when they lost to the Atlanta Hawks in the first round in 2016, they’re slogan for the playoffs “were one superstar.” They’re attitude was that it doesn’t matter who scores the ball, as long as someone does. Today’s Celtics need that same level of unselfishness to make a splash. 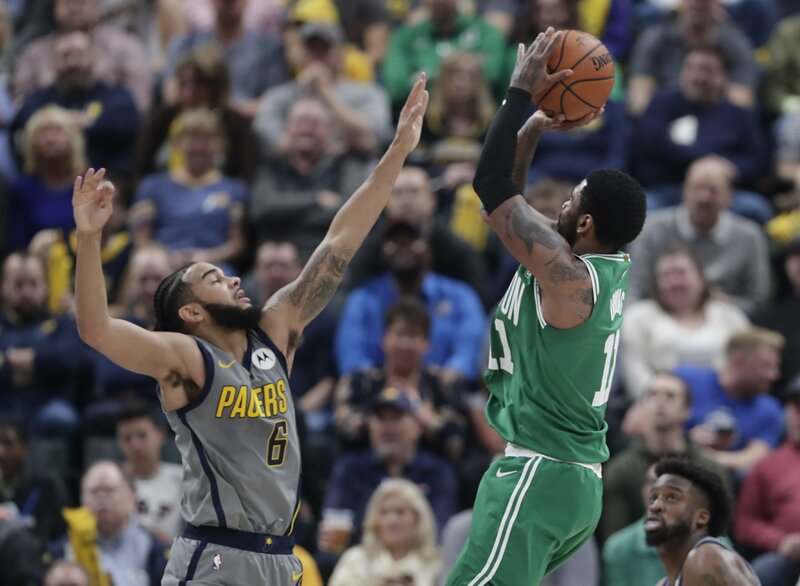 The Pacers got to where they are now because they pass to the open player, not the best player, and if the Celtics don’t adopt that style, they might get passed by the Pacers onto the second round. Kyle Miller is a football and basketball letterman at Hull High School who will begin his path as a sports journalism major at the University of Massachusetts at Amherst in the fall of 2019. Kyle is a passionate Boston sports fan who one day wants to be the General Manager of the Boston Celtics.